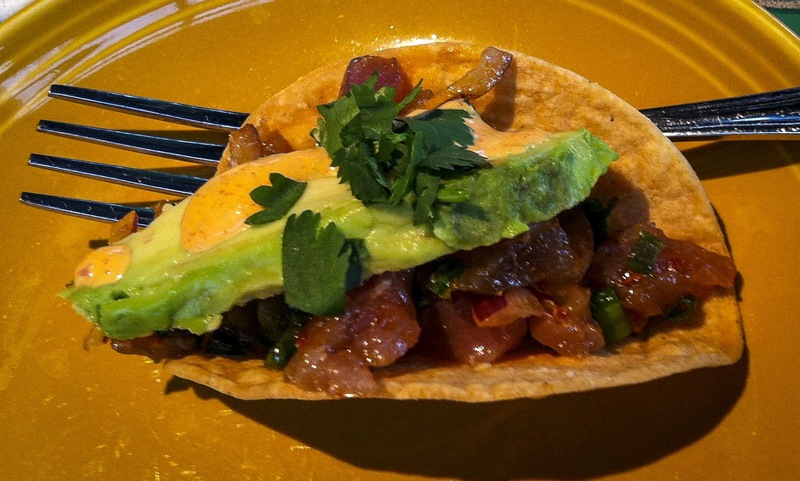 What combination of flavors, textures and preparation makes for an awesome fish taco? Grilled or fried fish? Corn or flour tortilla? Creamy sauce, fresh salsa or both? Shredded lettuce or cabbage? Pickled onions or jalapeños?... the questions go on and on. H and I began our search for answers. Memories of a Spring lunch at Marination Ma Kai (link) took us back to Seattle's Alki waterfront for Day One of our quest. 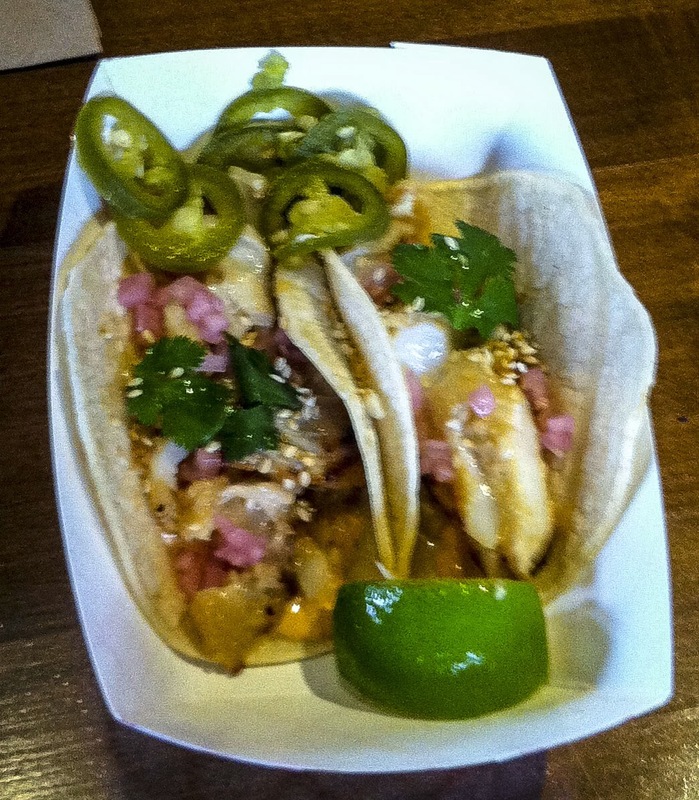 We revisited Ma Kai to resample their fish taco and establish a baseline for comparison. Grilled white fish would be the standard. First we sampled the fish. The marinade kept the perfectly-cooked cod moist but contributed little flavor. That was not a problem since the kimchi-flavored crema, pickled red onions, jalapeño rings and a few dashes of sriracha packed plenty of flavor into each subsequent bite. It was tempting to order another taco, but we had more stops to make. We headed farther west along the waterfront. Drat! the food cart that we thought would be on location was missing. Out of business? Seasonal schedule issues? Whatever! we continued on. Next we popped into a sit-down Mexican restaurant, happy to get out of the dreary drizzle outside. Hmmm, the atmosphere was dark, the seat-yourself joint was nearly empty and the menu noted their tacos held battered and fried fish. We quietly left without ordering, not that anyone really noticed or seemed to care. Finally we came to Cactus, a restaurant already familiar to both of us. Warmly welcomed by staff and then a cheery fireplace, we headed for a well-lit corner of the lounge. Torn between two fish taco choices on the menu we made the very practical decision to order both. Omigosh, the fish alone was delicious - ceviche-like in preparation and bursting with flavor. Smokey chipotle cream sauce and red onions added contrasting notes for a perfect bite. The avocado slice was pretty, but superfluous - this taco did not require decoration. The brittle corn tortillas served a display function but shattered at the first bite. Oops! no problemo, we could handle this challenge. Undaunted we pressed the halves together and enjoyed our flat, fish taco crispy tortilla sandwiches anyway. There is no photo of the next menu descriptor, but the Taco Pescado featured grilled cod, coriander, pasilla slaw, mango (I think) pico de gallo and buttermilk crema on a corn tortilla. The fish was moist, without a distinctive flavor of its own. Ah, but the toppings provided a lively, satisfying bite. 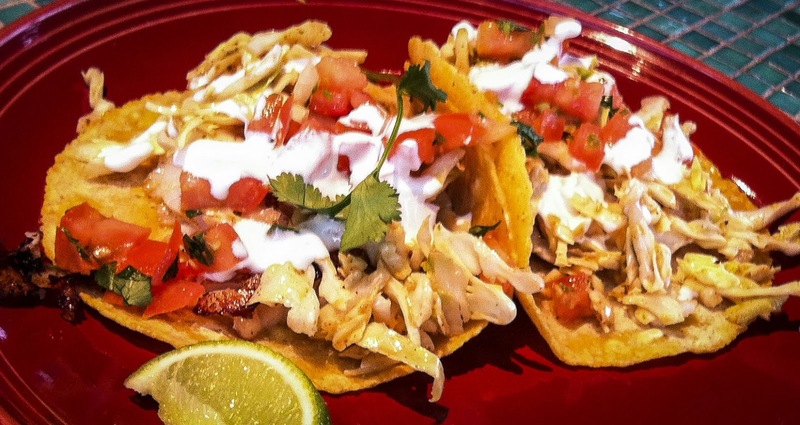 Pasilla coleslaw and fresh salsa added crunch and pop to this taco. The flavor of the corn tortilla seemed more discernible, distracting a bit from the overall taste combination. So we give high marks to Ma Kai's marinade and kimichi-flavored crema, to Cactus' flavorful ahi, chipotle crema and pasilla coleslaw. Obviously we need to keep searching. 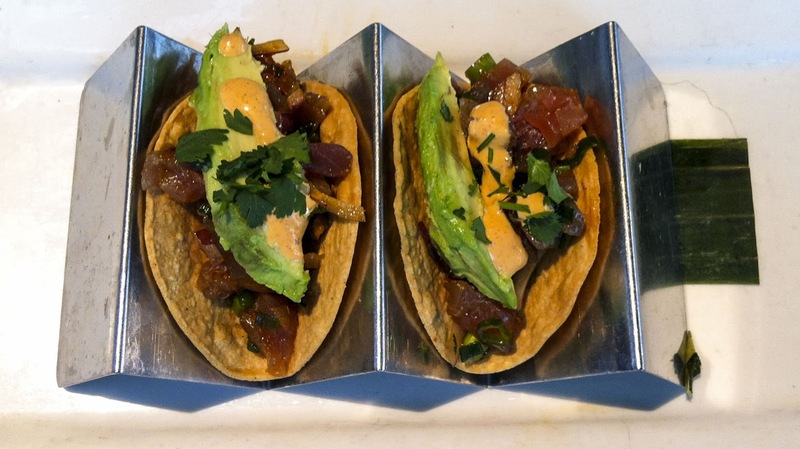 The food memory of a terrific fish taco at the Train Wreck Bar & Grill would draw me back to Burlington, but that's a long drive for a taco when we haven't begun to taste-test our way through Seattle yet. My favorite local hangout, the Columbia City Ale House, features a dynamite fish taco that is hard to resist, but it's breaded and grilled. We are focused on marinated and grilled this month. The search goes on. Do you have any suggestions for the team? We are committed to further research.